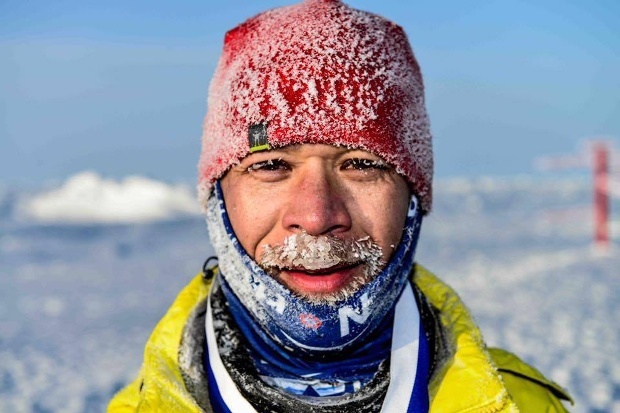 The world’s coolest race took place on Saturday (April 16) as 52 competitors from 18 countries pitted themselves against the extreme elements of the North Pole Marathon where temperatures were -41° degrees Celsius. This year, the race was held up for a week after severe weather conditions cracked the landing strip on the ice cap which delayed the arrival of the runners and officials. Operated at the drifting Russian Barneo Ice base at the Geographic North Pole, the event is run on the waters of the frozen Arctic sea ice. Several snipers were placed around the marathon circuit to protect the athletes from polar bears. The women’s race was won by Gulzhamal DeFelice of Russia/United States in five hours and 50 minutes, 30 minutes ahead of United States Alexandra Hanson. The biggest cheer of the day went to French runner Bruno Louges who was diagnosed with multiple sclerosis five years ago and completed the race in agony in 9:47.56 hrs.